Here are some terms that you might find useful as you work with the BDL168. Direct home wiring is a layout wiring method where each power district and its booster is electrically isolated. The track within each power district uses a "common return" wiring method for occupancy detection and/or power management. Direct home wiring is the wiring method recommended by Digitrax for safety reasons & also because it makes detection work more prototypically. Power district is the power wiring, track, components and equipment attached to that wiring, driven by a single properly isolated booster. The track for a power district is double gapped on both ends of the district. The BDL168 is used to set up detection sections within one or more power districts. Power sub-district is the wiring, components and equipment that are controlled from both power bus wires by their own power management device, for example a reversing section controlled by an automated reversing device like the PM42. Power sub-districts are gapped on both ends. Detection common is the common return used within a properly electrically isolated power district for implementing occupancy detection. Security element is the plant, including track, associated with any reporting, interlocking and/or signaling for that track section. Whole layout common rail is a method of wiring layouts where power districts and their boosters are connected electrically by a common rail or common power bus return wire. This method is traditionally used for conventionally controlled layouts. 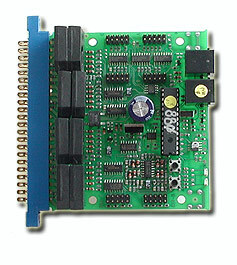 The track feeds for one rail are connected together to one output of the power pack. The other rail is gapped and the track feeds are connected to the power pack through block control switches. Whole layout common rail wiring has a disadvantage when it comes to detection systems because detectors are not able to independently monitor whether zone power is on or off. There is no way to tell whether occupancy detection is actually working in any given detection section. Detection Section is a section of track gapped on one or both rails and connected to an occupancy detector so that the detector can sense the presence of a loco (or other specially equipped cars) in that section of track. Occupancy detector is a device that senses the presence of a locomotive (or specially equipped cars) in a section of track that is set up for occupancy detection. Occupancy detectors also provide feedback to indicate occupancy. This feedback may be in the form of a lamp on a control panel or it may be a feedback message sent to the system that can be used by other layout devices. Also called a block occupancy detector on conventional layouts. Detectors are not covered by the DCC Standards or Recommended Practices. Transponder is an electronic device that is installed in rolling stock and can be assigned a unique address. Transponders provide information to transponder detectors installed on the layout. This lets the system determine in which detection section the transponder is currently located. Transponders are included in all current production Digitrax decoders and many older models as well. TL1 & TF4 function only decoders with transponding are available as separate units that can be added to locos with existing decoders or to other rolling stock without decoders if you want to use them for transponding only and don't need motor control. Transponder detector is an electronic device installed in a detection section on the layout that receives the information broadcast from a transponder. The transponder detector sends feedback to the system to let it determine the detection section location of any given transponder at any time. Your BDL168 can host one or two RX4s. One RX4 transponder detector can be hosted by a BDL168; this enables 4 transponder zones on the BDL168. In this case, each transponding zone may encompass one to four detection sections. Each BDL168 can host an additional RX4 giving you a total of 8 transponder zones that can be shared across the available 16 detection sections of the BDL168. Note: When automatic reversing is used there are special considerations in grouping detection sections and transponder zones within your BDL168.